While the visibility of disability studies has increased in recent years, few have thoroughly examined the marginalization of people with disabilities through the lens of political economy. This was the great contribution of Marta Russell (1951-2013), an activist and prominent scholar in the United States and best known for her analyses of the issues faced by people with disabilities. 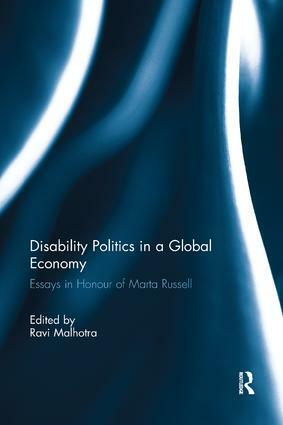 This book examines the legacy of Marta Russell, bringing together distinguished scholars and activists such as Anne Finger, Nirmala Erevelles and Mark Weber, to explicate current issues relevant to the empowerment of people with disabilities. Drawing from various fields including Law, Political Economy, Education and History, the book takes a truly interdisciplinary approach, offering a body of work that develops a dextrous understanding of the marginalization of people with disabilities. The book will be of great use and interest to specialists and students in the fields of Political Economy, Law and Society, Labour Studies, Disability Studies, Women’s Studies, and Political Science. Ravi Malhotra is Associate Professor at the University of Ottawa, Faculty of Law, Common Law Section. He co-authored a piece with Marta Russell in Socialist Register in 2001.